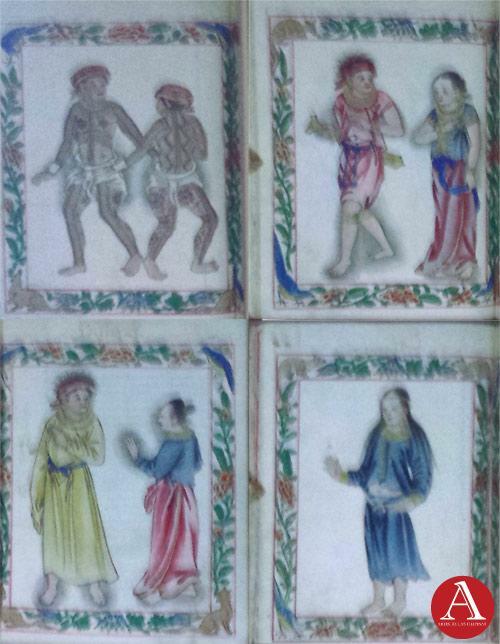 In the Philippines, the 10th and 14th centuries were years of political, economic, and social progress, when primary artistic and scientific development occurred. 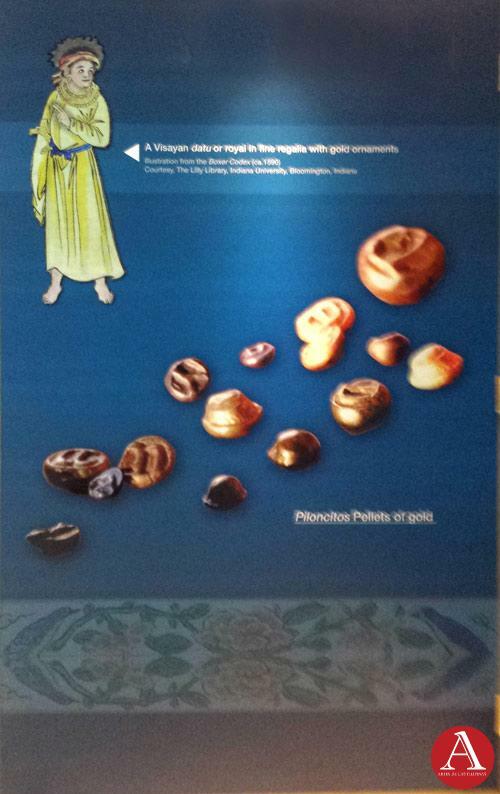 Unearthed gold ornaments manifest a rich material culture dating almost 300 years before Spanish colonizers discovered the island. Meticulously crafted pre- Hispanic gold objects of warying usage from ornamentation to ceremony to currency have been discovered acroos the country. Of these discoveries, the most notable is the Surigao treasures found in1981, a cache consisting of 15 to 30 kilograms of ancient gold. 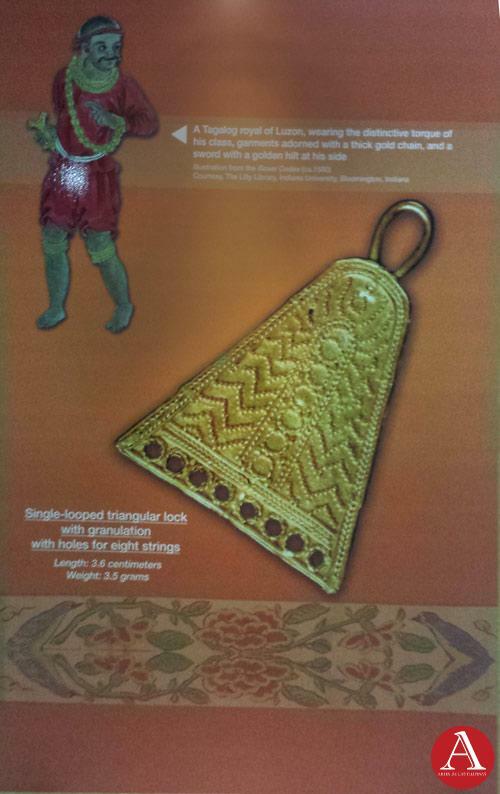 The 10th to 13th pieces were wrought through sophisticated and complicated techniques, baring the deep-seated knowledge and unparalled skill of the ancient panday-ginto(gold artisan). These artifacts could be classified according to provenance, that is geographic areas where they were recovered, revealing not only heir widespread distribution but also the historical movements of the people, patterns of pre colonial interisland trade and cultural exchange. 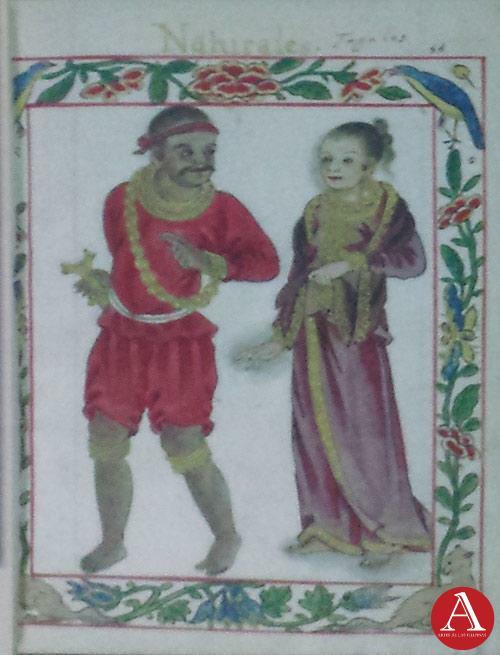 A number of personal ornaments are uniquely only to specific areas, such as the kandit belts in Mindanao, suggesting that there were cutural identities peculiar to certain groups. • Bracelets with fluted design and flaring rims. • Large conical necklace finials. • Pair of long pendant double swirl earrings. • Terra cotta Figure with inlaid gold. • Large square quatrefoil earrings. • Set of five graduated bracelet. • Patan-aw or “look at me” earrings. • Uod or caterpillar ear ornaments. 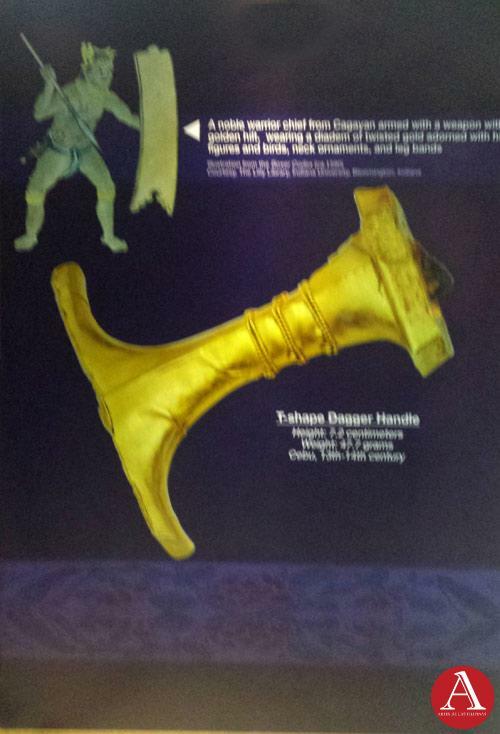 A noble warrior chief from Cagayan armed with a weapon with golden hilt, wearing a diadem of twisted gold adorned with human figures and birds, neck ornaments and leg bands. Weapons with gold handles were used in ceremonies, and gold itself was regarded to have amuletic properties, an important property of rituals, gold was thought of as a divine substances conferring longevity on the possessor or a powerful talisman capable of protecting the bearer. 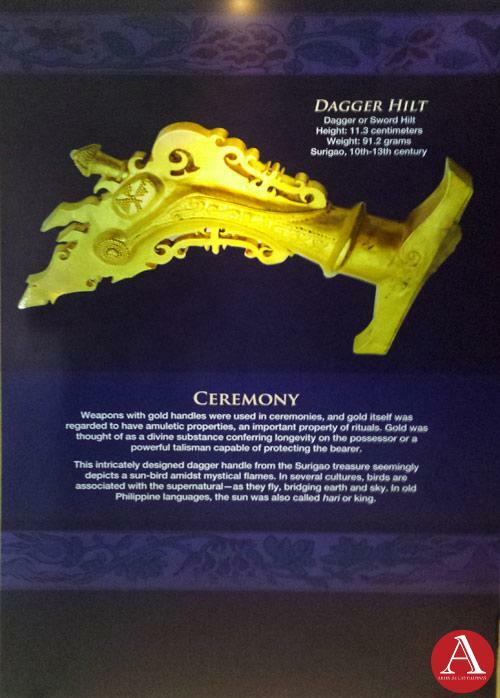 This intricately designed dagger handle from the Surigao treasure seemingly depicts a sub amidst mystical flames. In several cultures, birds are associated with the supernatural- as they fly, bringing earth and sky, In old Philippines language, the sun was also called hari or king. 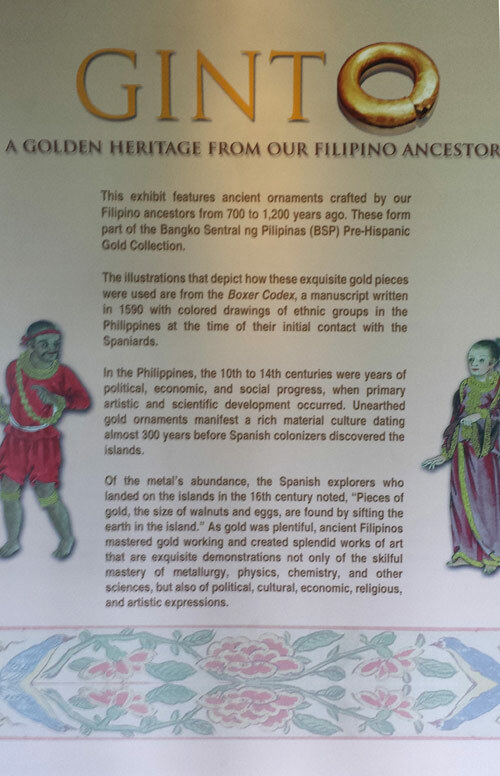 It is said that some of the most aesthetically pleasing ancient gold ornaments have been found in the Philippines. It was during pre-colonial times that there was such political, economic and social progress, allowing the development and honing of primary artistic skills. These dangling earrings are called, patan-aw or “look at me” earrings as their movements are meant to call attention to the wearer. Articulation or the movement of joined parts is achieved by fusing zigzagging gold wire into hallow hoops. From these dangle multiple round rhomboidal and foliate spangles. Wife of a Tagalog royal or noble wearing heavy gold earrings and a robe and shawl braided and edged with gold. 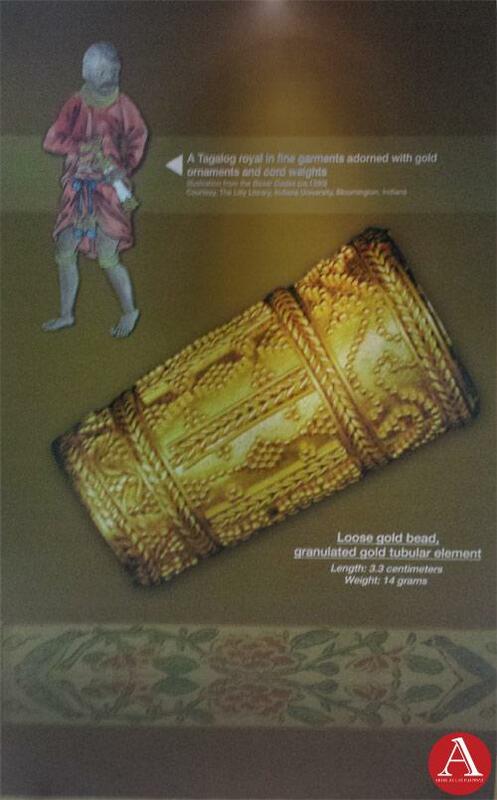 A Visayan Datu or royal in the regalia with gold ornaments. Then and now, gold remains as a store value. 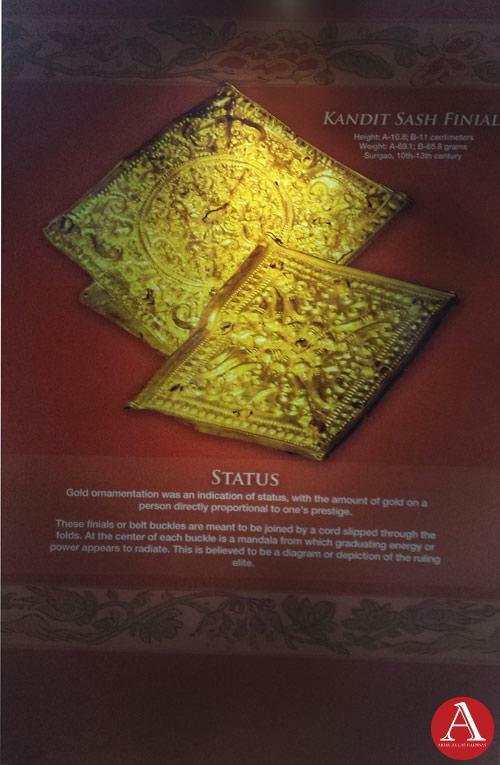 Gold was not only used as jewelry but also as currency. 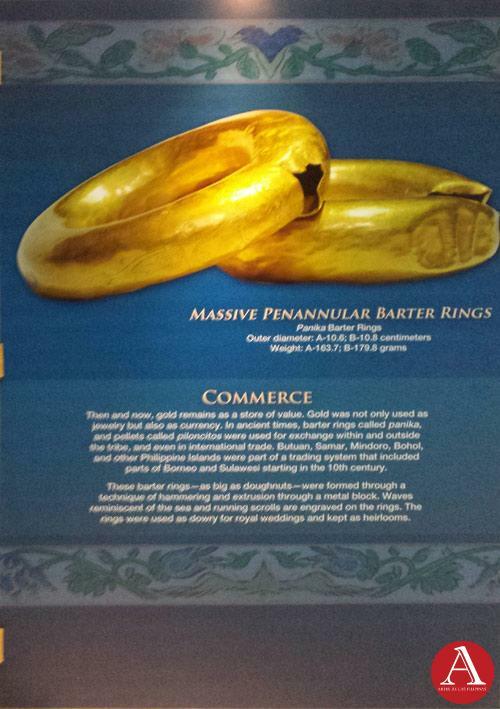 In ancient times, barter rings called panika and pellets called pitoncitos were used for exchanged within and outside the tribe, even in international trade, Butuan, Samar, Mindoro, Bohol, and other Philippine Islands were part of a trading system that included parts of Borneo and Sulawesi starting in 10th century. These barter rings- as big as doughnuts-were formed through a technique of hammering and extrusion through a metal block. Waves reminiscent of the sea and running scrolls are engraved on the rings. 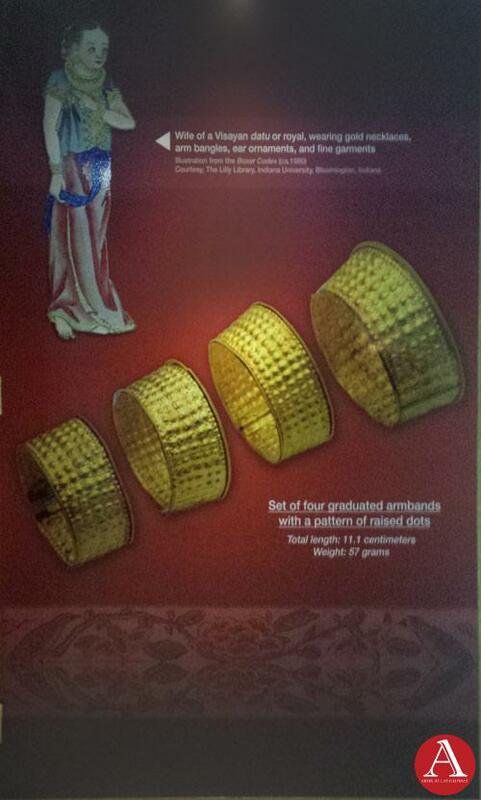 The rings were used as dowry for royal weddings and kept as heirlooms. 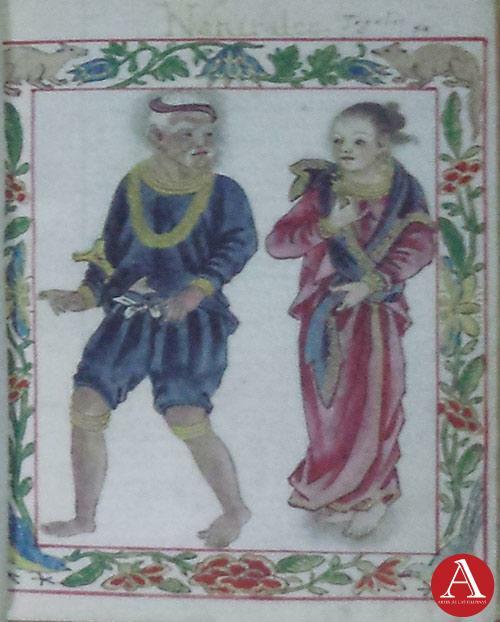 Wife of a Tagalog maginoo or noble heavily ornamented with gold finery. 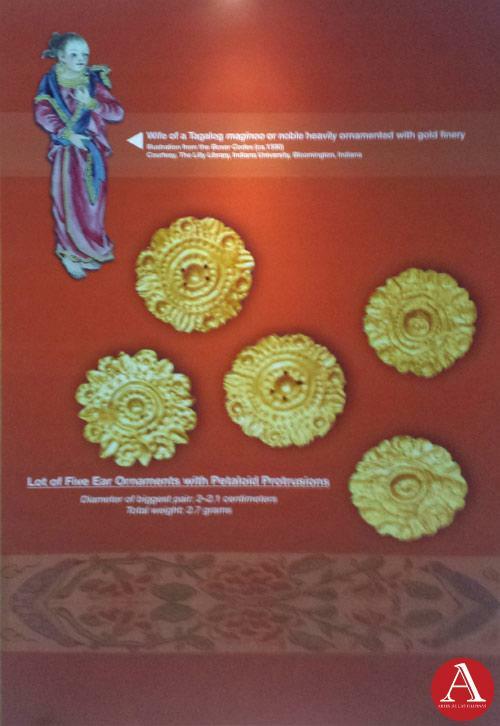 Gold ornamentation was an indication of status with the amount of gold on a person directly proportional to one’s prestige. These finials or belt buckles are meant to be joined by a cord slipped through the folds. At the center of each buckle is a mandala from which graduating energy or power appears to radiate. This is believed to be diagram or depiction of the ruling elite. 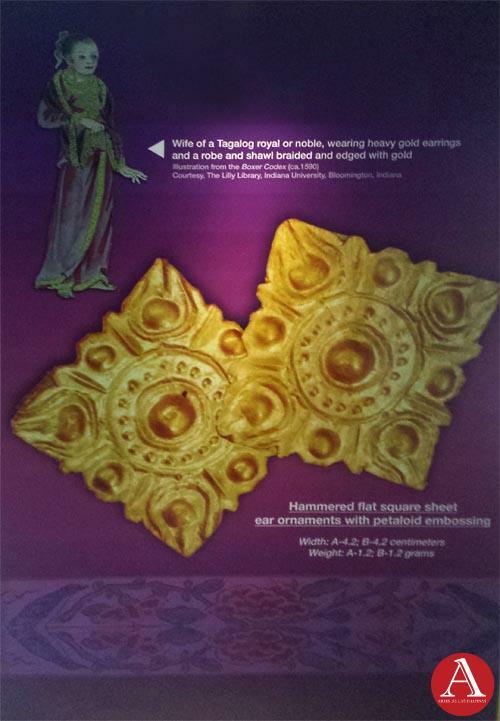 It was not uncommon to find classic gold ornaments with diagrammatic forms or with composition based on various combinations of squares, circles or crosses. 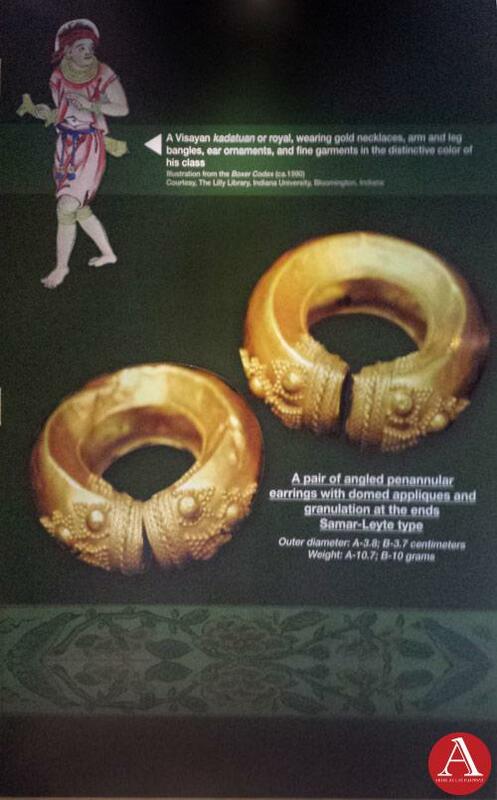 These large ear ornaments from Mindoro resembles an abstract flower where deft snips on the sides suggest petals. In each center is a dome surrounded by rings of plain wire and circles twisted ones. The centers’ rims are edged with dot work. Because of the frequency of this motif, it is believed that the flower was extremely important as a symbol of ancient concepts of life. The design also suggests familiarity with Hindu-Buddhist concepts as well as Chinese mythology, fused with indigenous traditions. Set of four graduated armbands with pattern of raised dots. 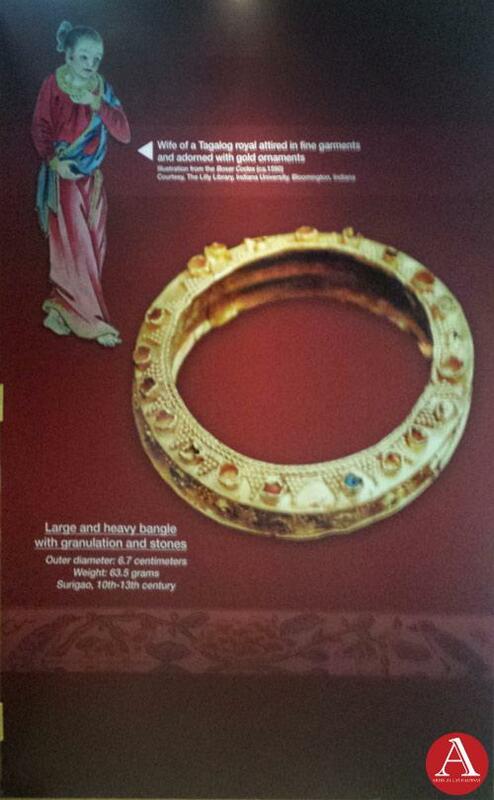 Wife of a Visayan datu or royal, wearing gold necklace arm bangles, ear ornament and fine garments. 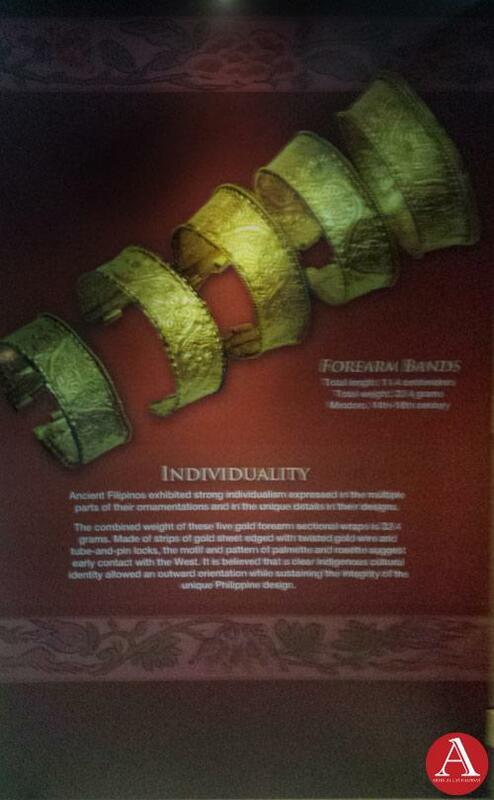 Ancient Filipinos exhibited strong individualism expressed in the multiple parts of their ornamentation and in the unique details in their designs.The combined weight of these five gold forearm sectional wraps is 32.4 grams. Made of strips of gold sheet edged with twisted gold wire and tube-and-pin locks, the motif and pattern of palmetto and rosette suggest early contact with the west. 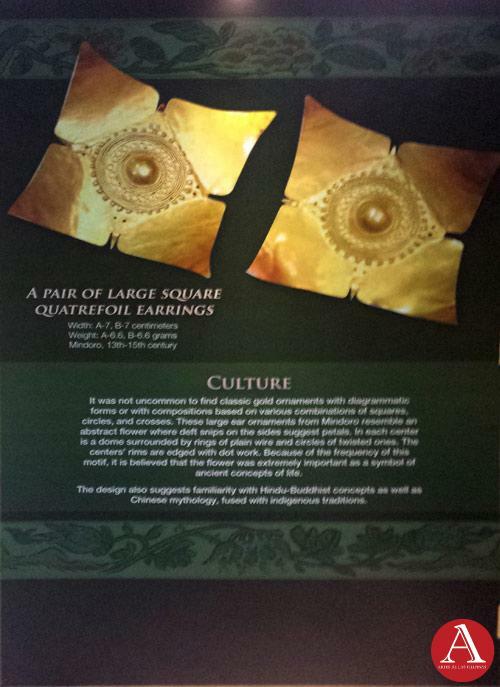 It is believed that a clear indigenous cultural identity allowed an outward orientation while sustaining the integrity of the unique Philippine design. A pair of angled pen annular earrings with domed appliques and granulation at the ends Samar-Leyte type. 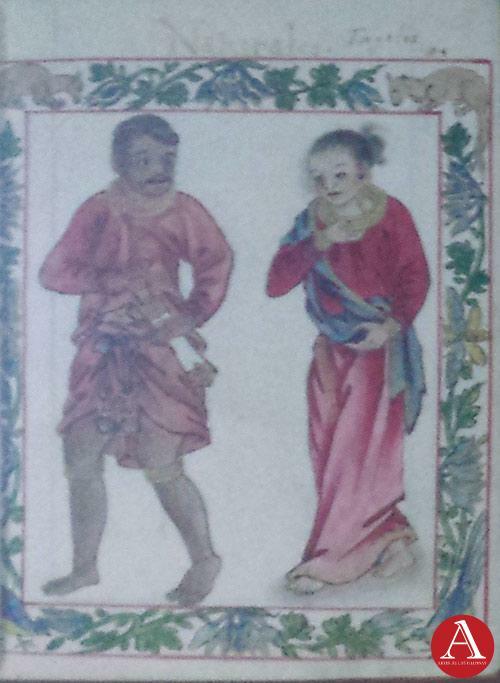 A visayan kadatuan or royal, wearing gold necklace, arm leg bangles, ear ornaments, and fine garments in the distinctive color of his class. 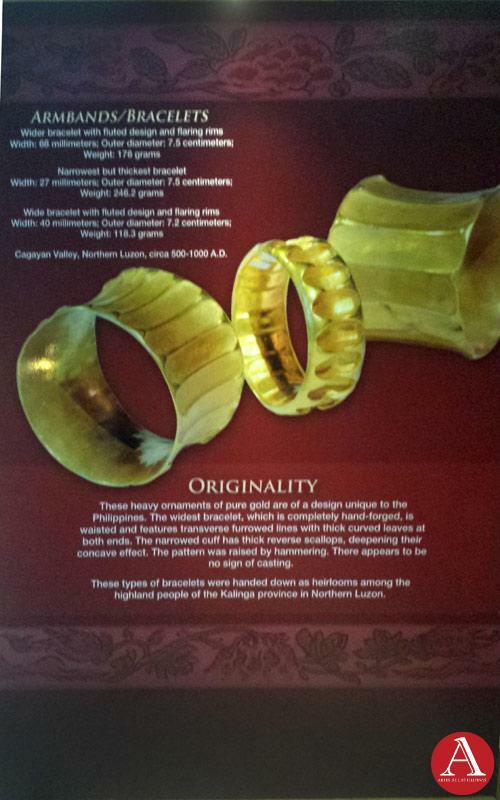 Fashioning raw materials into fine pieces of wrought gold called great skill. 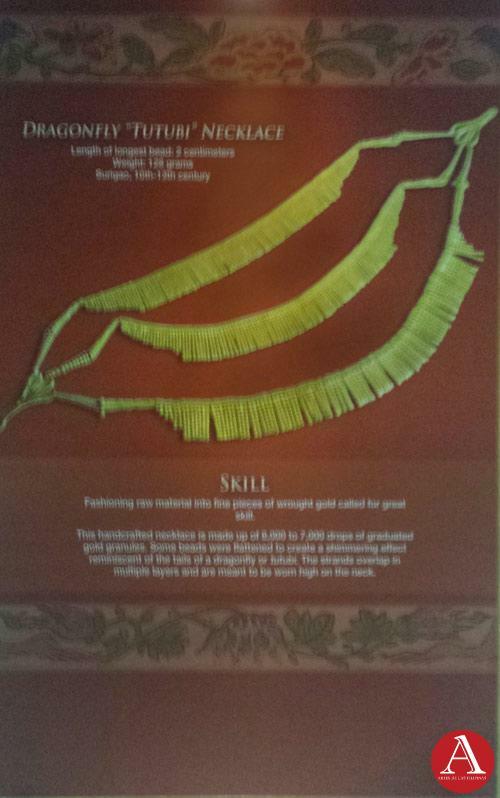 This handicraft necklace is made up of 6,000 to 7,000 drops of granulated gold granules. Some beads were flattened to create a shimmering effect reminiscent of the tails of a dragonfly or tutubi. The strands overlap in multiple layers and are meant to be worn high on the neck. Single-looped triangular lock with granulation with holes for eight strings. 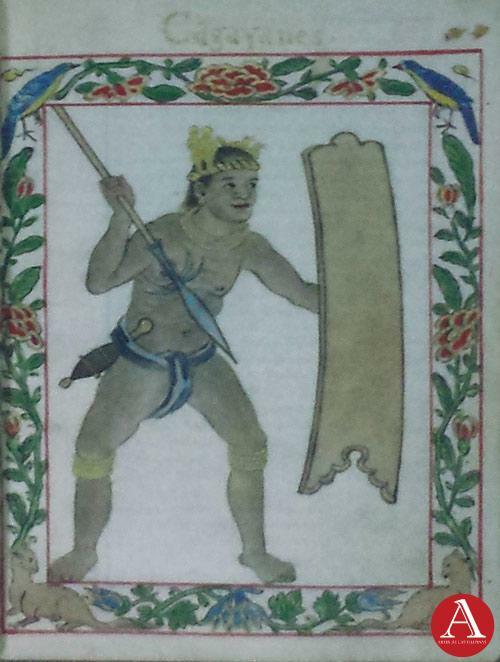 Tagalog royal of Luzon, wearing the distinctive torque of his class, garments adorned with a thick gold chain, and a sword with golden hilt at his side. These conical finials are usually fine. The granulation, using sizes of up to 0.025 centimeters, coud have only been executed by a master of the technique, a skilled panday-ginto or goldsmith. 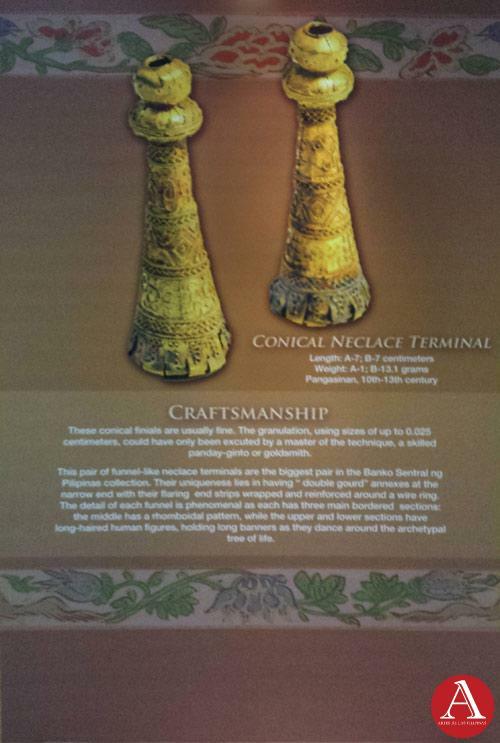 This pair of funnel-like necklace terminals is the biggest pair in the Bangko Sentral ng Pilipinas collection. Their uniqueness lies in having “double gourd” annexes at the narrow and with their flaring and strips wrapped and reinforced around a wire ring. The detail of each funnel is phenomenal as each has three main bordered sections: the middle has a rhomboidal pattern, while the upper and lower sections have long-haired human figures, holding long banners as they dance around the archetypal tree of life. Large and heavy bangle with granulation and stone. Wife of a tagalog royal attired in fine garments and adorned with gold ornaments. 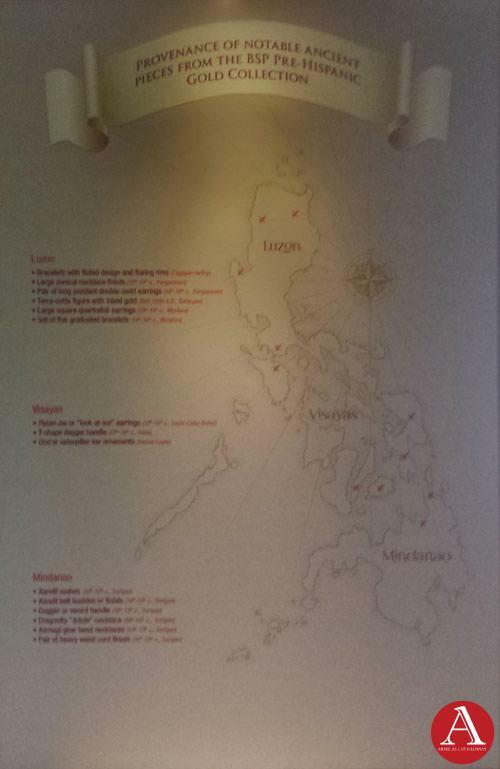 Cagayan Valley, Northern Luzon, circa 500-1000 A.D. 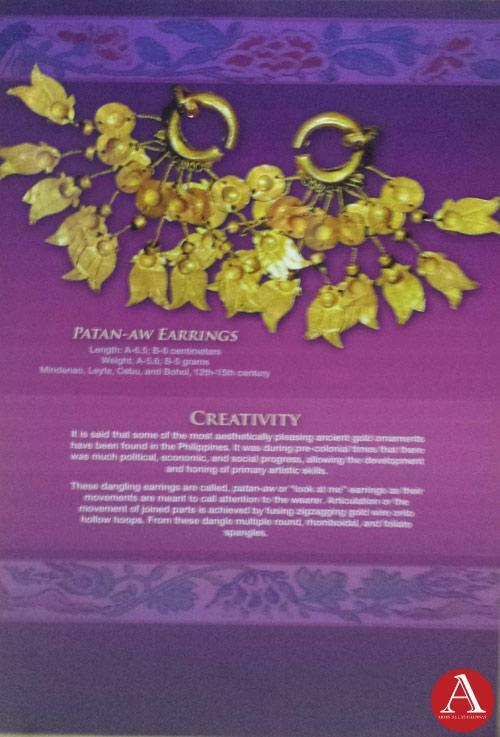 These heavy ornaments of pure gold are design unique to the Philippines. The widest bracelet, which is completely hand-forged, is waisted and features transverse furrowed lines with thick curved leaves at both ends. The narrowed cuff has hick reverse scallops, deepening their concave effect. The pattern was raised by hammering. There appears to be no sign of casting. Ornamentation elaborately provided by this necklace was a measure of prestige and wealth. Gold was also considers protection against stealth attacks.This long linked–up kamagi is made up of interlocking tooth-like graduated, short, and spherical beads with semated edges. A snake spine may have been its inspiration. 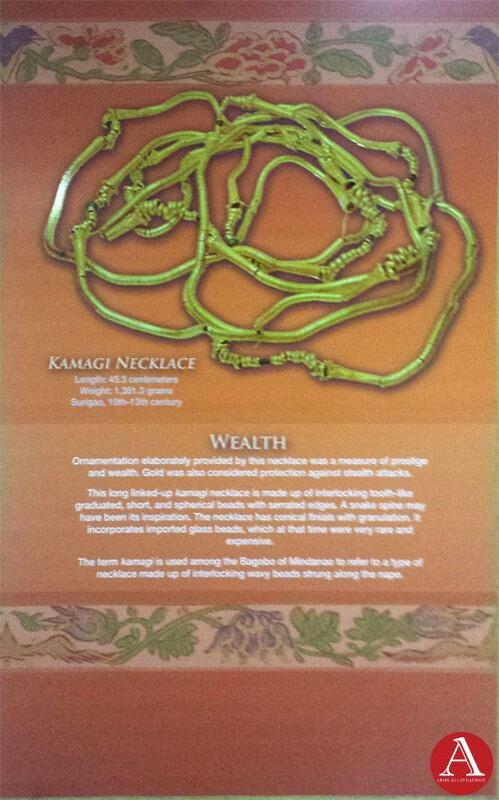 The necklace has conical finials with granulation. It incorporated imported glass beads, which at that time were very rare and expensive. 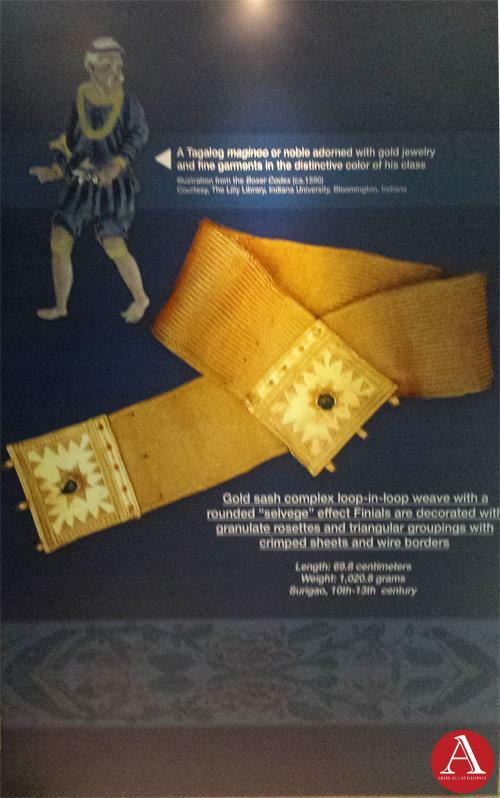 A Tagalog royal garment adorned with gold ornaments and cord weights. Gold sash complex loop-in-loop weave with a rounded “selvege” effect finials are decorated with granulate rosettes and triangular groupings with crimped sheets and wire borders. NOTE: This BSP exhibition is housed at the lobby of the Department of Foreign Affairs, Roxas Boulevard, Manila.